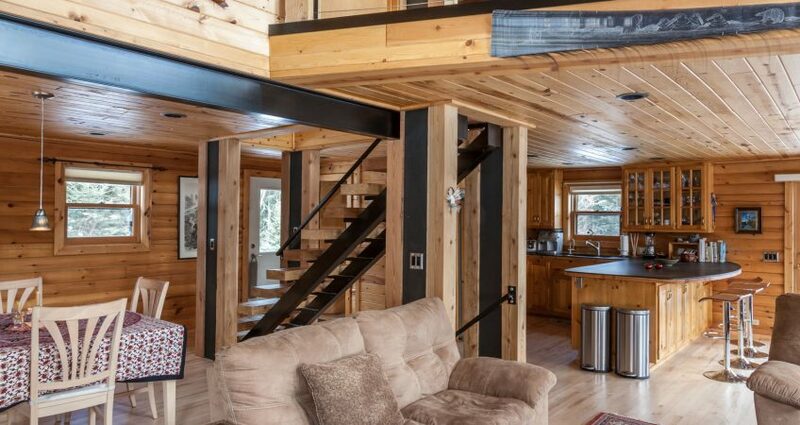 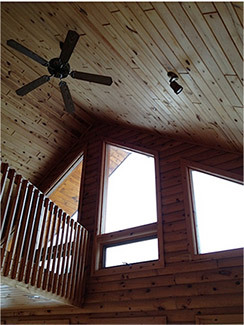 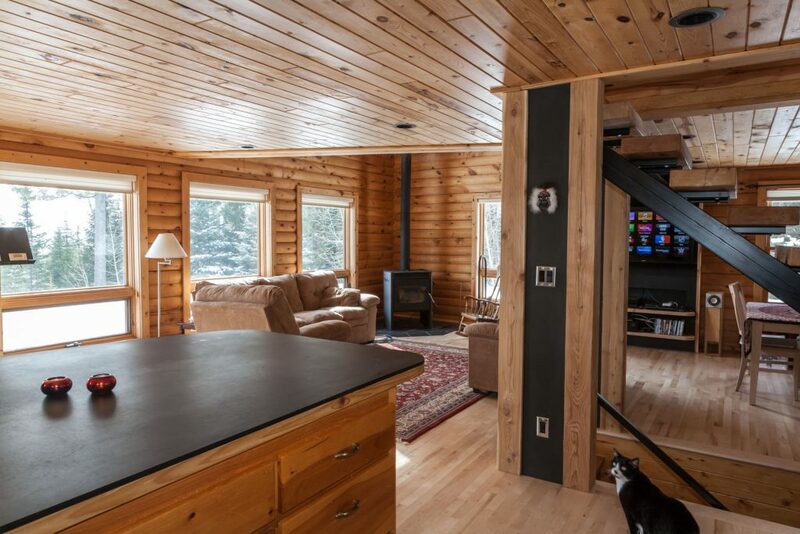 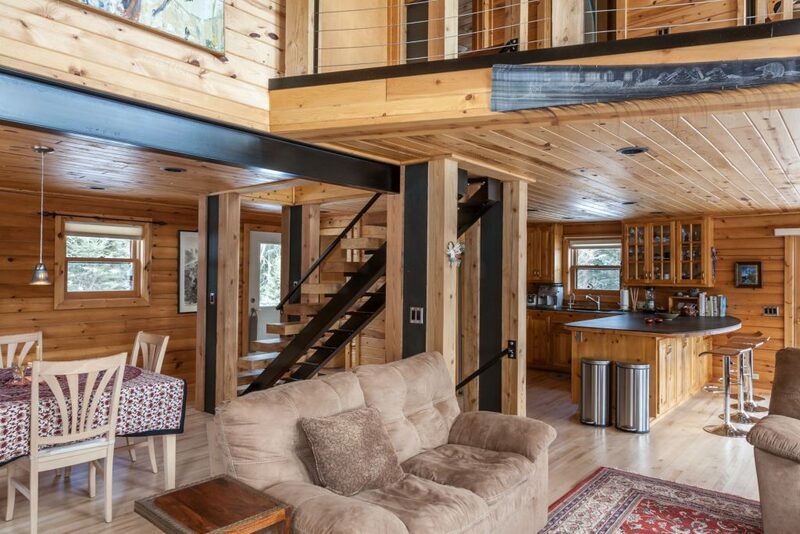 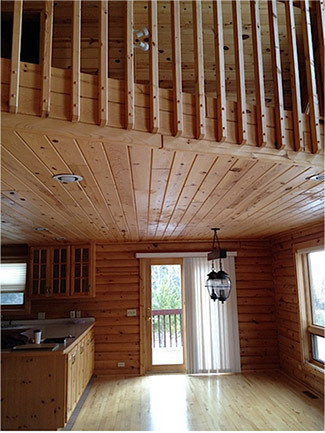 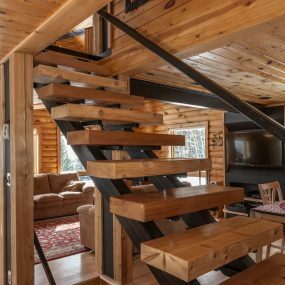 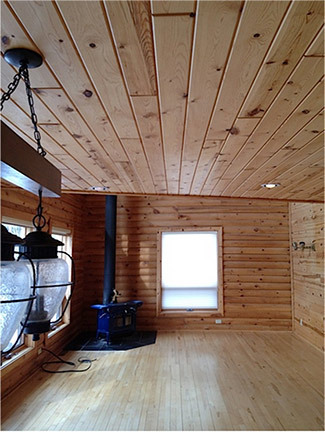 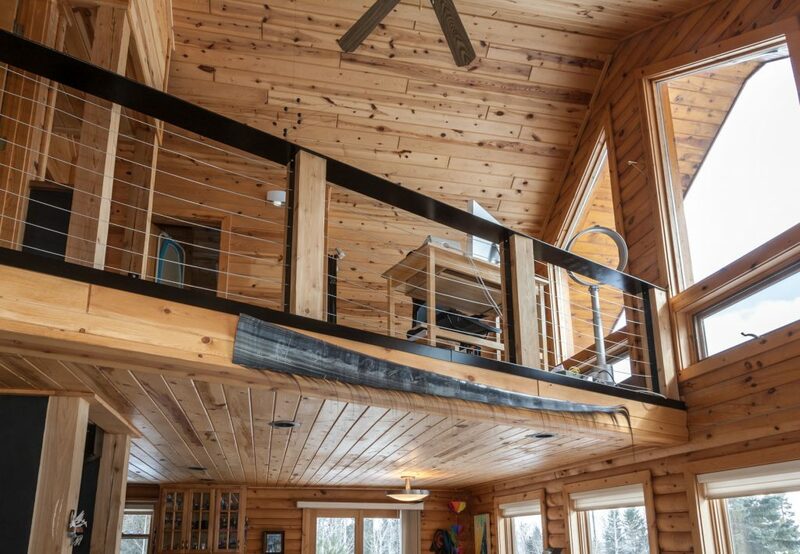 A couple moved to Duluth for work from Alaska and purchased a beautiful log style home on the shore of Lake Superior. 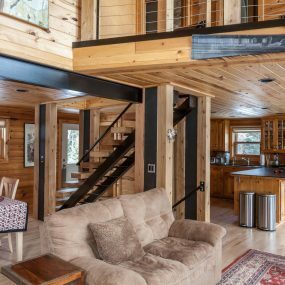 The home was almost perfect for the couple, but there were a few updates they wanted to make their house their new home. 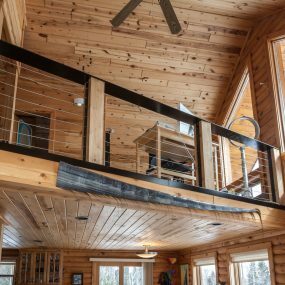 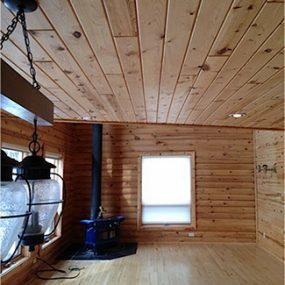 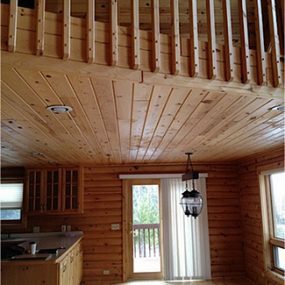 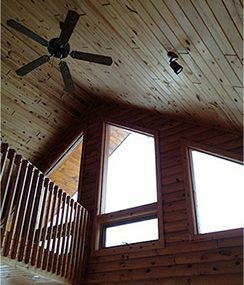 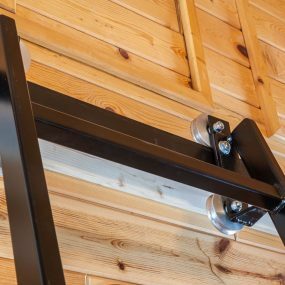 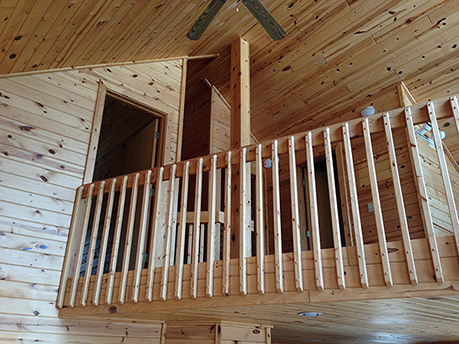 Knutson Custom Construction was able to exceed the expectations of the couple with all their craftsmanship and quality of work. 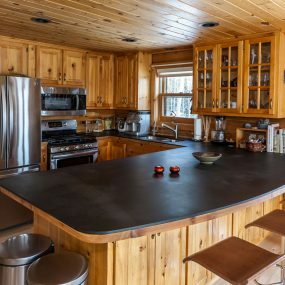 The couple likes to entertain so they wanted to have a larger kitchen countertop in order to serve food, seat people, etc. 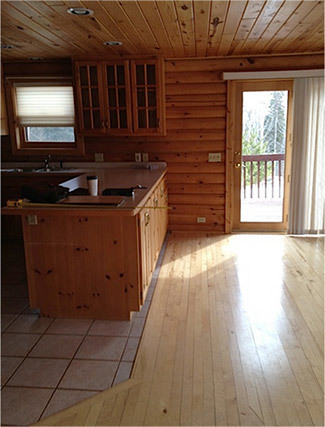 They expanded the countertop and changed its shaped from rectangle to curved. 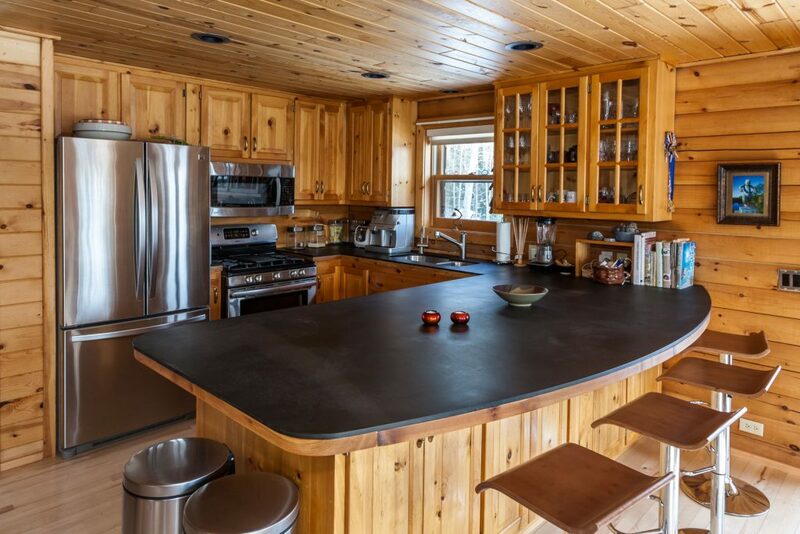 The new countertop is a large piece of black richlite. 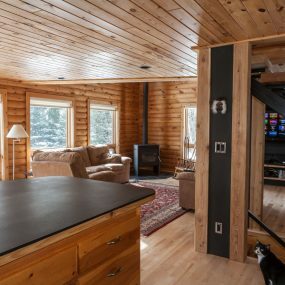 The couple also wanted a more open floor plan, so a wall was knocked down in the living room and a large entertainment center was custom built into the wall to house the TV/stereo/entertainment pieces. 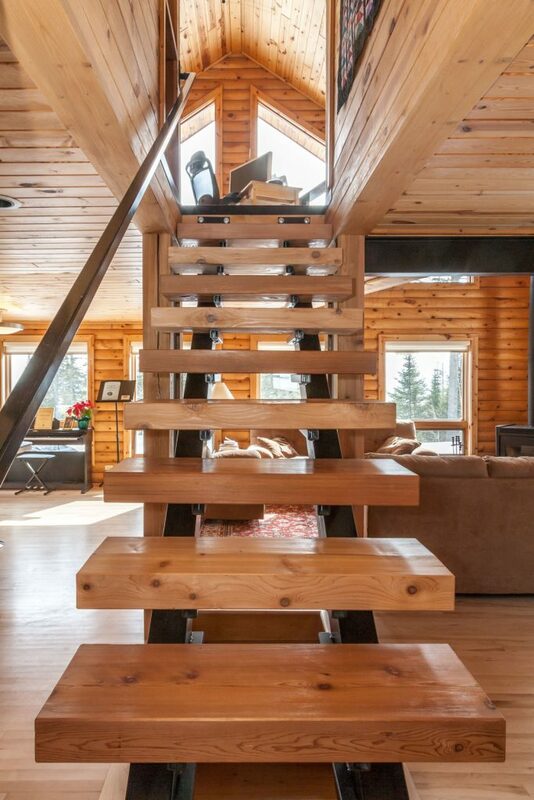 When the downstairs was opened up the stairway was also opened up. 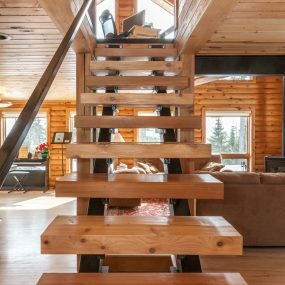 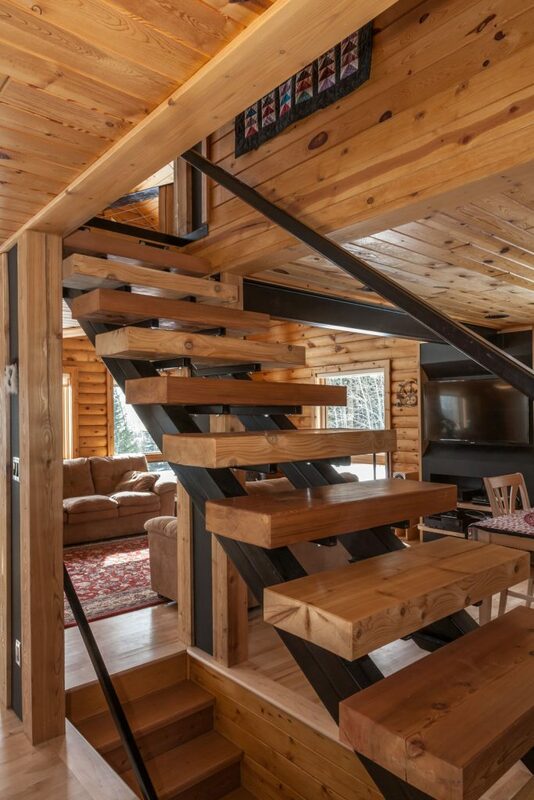 Knutson built a beautiful open stair case with wood and metal touches to enhance the beauty of the space. 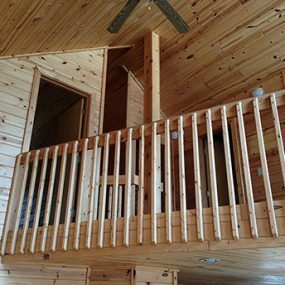 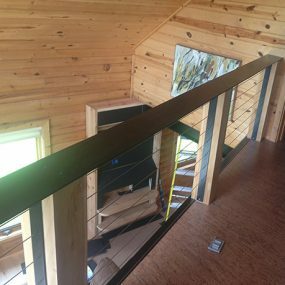 Keeping with the open concept Knutson built a more modern cable railing on the 2nd floor loft to replace the old spindle style railing. 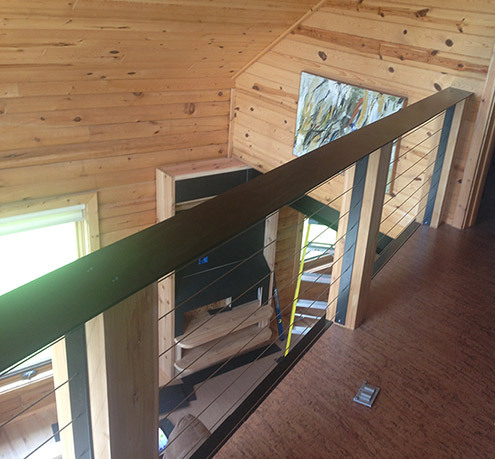 With the new railing there is more light that shines through the house and makes the transition from the 1st floor to the 2nd floor more of an open concept feel. 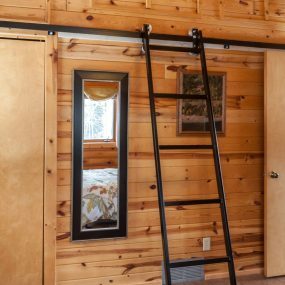 The final touch that the clients were looking for was a library ladder to access their storage cabinets in one of their rooms on the 2nd floor. 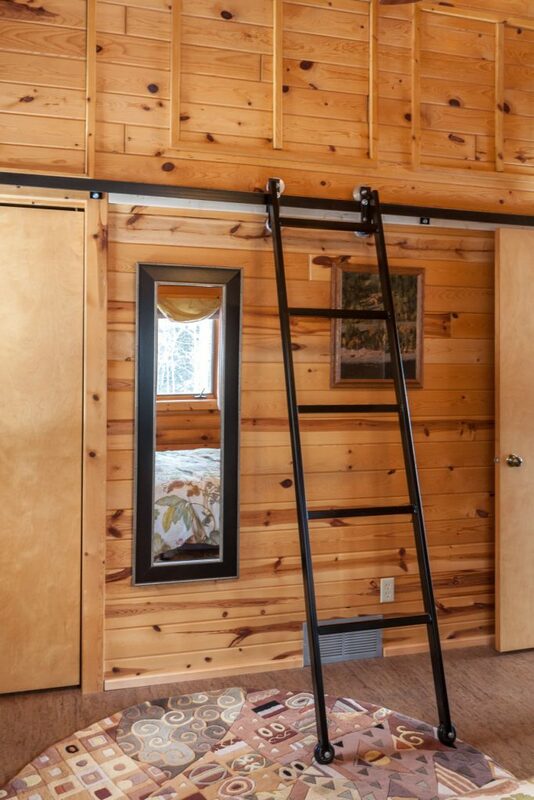 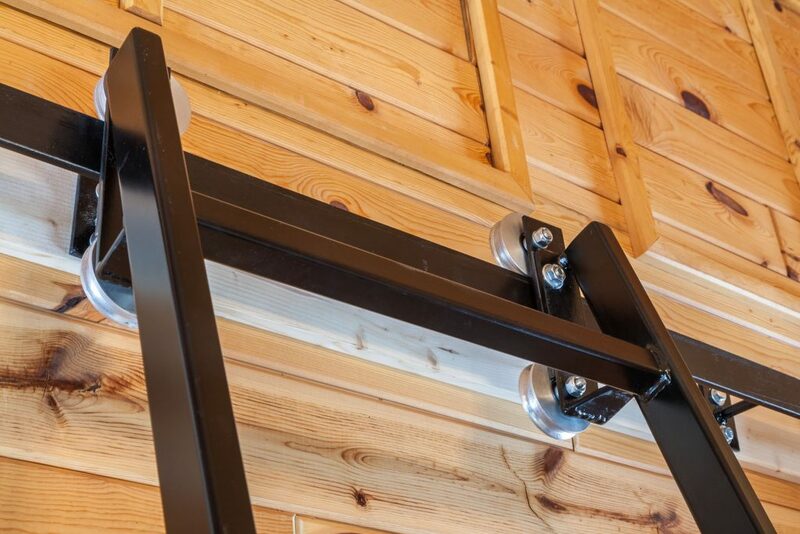 Andrew Knutson was able to design and fabricate a custom ladder just for their house. 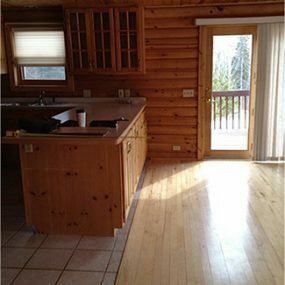 The clients were more than satisfied with all of the work that was completed in their house..they now have a new place to call home.